In 1819, the combined Mount Zion Lutheran and Reformed congregations built a church on the site of the present church, at the corner of Mount Zion and Mount Phillip Roads. 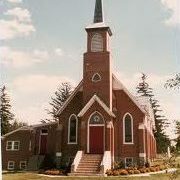 The present brick church was built in 1885. At some point in the early 20th century, the Mount Zion Reformed Church congregation disbanded, leaving the present church to a small but active Lutheran congregation. The genealogical records for the Mount Zion Reformed Church were discovered among the collection of records at Jefferson United Church of Christ in Jefferson, Maryland. This single ledger contained baptism and death entries, both dating from 1875, but no marriage entries were recorded.